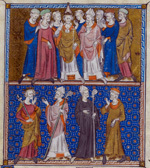 Decoration 223 prefatory miniatures in colours, in tinted drawing, generally two per page, of the Old Testament cycle with Anglo-Norman explanatory verses (ff. 1v-66v) and 4 miniatures in colours and gold of the tree of Jesse, Ancestors of Christ, and Apostles and Prophets (ff. 67v-70). 12 miniatures in colours and gold of the Labours of the Months and 12 miniatures in colours and gold of the Signs of Zodiac, in the calendar (ff. 71v-83). 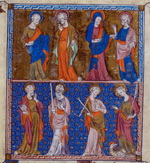 87 half- or full-page miniatures in colours and gold of the life of Christ, some on burnished or tooled grounds, in Psalms, and 13 miniatures in colours and gold of Saints, in the Litany (ff. 304-310). 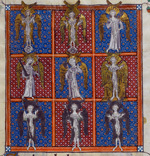 23 historiated initials in colours and gold with foliated extensions, at the beginning of the major text divisions. 464 bas-de-page scenes in tinted drawing (ff. 85v-318). Foliate initials in gold and colours with marginal extensions. Initials in gold on blue and rose grounds with penwork decoration in white. Line-fillers in rose, blue, and gold with penwork decoration in white. Binding Post-1600. Rebound in 1912 reusing embroidered boards with gilt metalwork bosses and fittings for clasps of c. 1553-1558; gilt edges. Provenance Isabella [Isabella of France] (b. 1295, d. 1358), queen of England, consort of Edward II: perhaps made for her (see discussion Smith 1993 and Stanton 1996 and 2003), or Edward II [Edward of Caernarfon] (b. 1284, d. 1327), king of England and lord of Ireland, and duke of Aquitaine: Edward the Confessor is included in gold in the calendar (f. 80v). Thomas Becket in gold erased in the calendar. Henry Manners, 2nd earl of Rutland (b. 1526, b. 1563), courtier and soldier, arrested at the accession of Queen Mary in 1553: inscribed, 'This boke was sume tyme [under erasure: the Erle of Rutelands], and it was his wil / that it shulde by successioun all way / go to the [under erasure: lande of Ruteland] or to / [partially erased: him that linyally succedis by reson / of inheritaunce in the seide lande'] (f. 84). Seized by customs officials in October 1553 and presented by the Customs Officer Baldwin Smith to Queen Mary Tudor: inscribed 'hunc librum nautis ad exteros transvehendum datu[m]: / spectatus et honestus vir baldwinus Smithus Londini / a portoriis et vectigalibus retraxit atq[ue] Mariae illustrissi/mae angliae, ffranciae, et hiberniae Reginae donavit, / mense Octobri, Anno domini millesimo quingentesimo / quinquagesimo tertio, Regni sui primo' (f. 319v). Mary I (b. 1516, d. 1558), queen of England and Ireland: presented to her (see inscription above); her badge of a pomegranate on the cover, with Tudor badges of a portcullis, fleur-de-lis, and a lion and a dragon engraved on the clasps of the binding. The Old Royal Library (the English Royal Library): perhaps included in the catalogue of 1666, Royal Appendix 71, f. 15v; and in the 1698 catalogue of the library of St James’s Palace (see [Edward Bernard], Catalogi librorum manuscriptorum Angliae et Hiberniae (Oxford: Sheldonian, '1697', but 1698? ), no. 7768). Includes 150 Psalms (ff. 85-280) with a calendar of Sarum use (ff. 71v-83), canticles (ff. 280v-302) and litany (ff. 302v-318). Walter de Gray Birch and Henry Jenner, Early Drawings and Illuminations: An Introduction to the Study of Illustrated Manuscripts (London: Bagster and Sons, 1879), p. 8. Bertold Georg Vitzthum, Die Pariser Miniaturmalerei von der Zeit des hl. Ludwig bis zu Philipp von Valois und ihr Verhältnis zur Malerei in Nordwesteuropa (Leipzig, 1907), p. 77, pl. 17. Augustus Hughes-Hughes, Catalogue of Manuscript Music in the British Museum, 3 vols (London: British Museum, 1965, a facsimile of the edition of 1906-09), III, p. 373. J. A. Herbert, Illuminated Manuscripts (London: Methuen, 1911), pp. 221-23, pls 31-32. George Warner, Queen Mary's Psalter: Miniatures and Drawings by an English Artist of the 14th Century, Reproduced from Royal MS. 2 B. VII in the British Museum (London: British Museum, 1912) [partial facsimile, reproducing all pictorial material]. Robert Steele, 'Dies Aegyptiaci', Proceedings of the Royal Society of Medicine, 13 (1919), 108-21 (p. 116). Schools of Illumination: Reproductions from Manuscripts in the British Museum, 6 vols (London: British Museum, 1914-1930), III: English A.D. 1300 to 1350 (1921), pls 10-13. George F. Warner and Julius P. Gilson, Catalogue of Western Manuscripts in the Old Royal and King’s Collections, 4 vols (London: British Museum, 1921), I, pp. 42-47. [J. A. Herbert], British Museum: Reproductions from Illuminated Manuscripts, Series 3, 3rd edn (London: British Museum, 1925), pl. 20-22. Eric. G. Millar, English Illuminated Manuscripts of the XIVth and XVth Century (Paris: Van Oest, 1928), pl. 30-36. O. E. Sounders, English Illumination, 2 vols (Paris: Pegasus Press, 1928, reprinted New York: Hacker Art Books, 1970), I, pp. 91, 94-98, II, pls 101, 102. F. Moll, 'Der Schiffbauer in Der Bildenden Kunst', Deutsches Museum Abhandlungen und Berichte (1930), 153-79 (p. 171). Guide to an Exhibition of English Art gathered from Various Departments and held in the Prints and Drawings Gallery (London: British Museum, 1934), no. 120. The Bestiary of Guillaume le Clerc: Originally Written in 1210-11, transl. and ed. by George C. Druce (Ashford: Headley, 1936), p. 9. Joan Evans, English Art 1307-1461, Oxford History of English Art, 5 (Oxford: Clarendon Press, 1949), pp. 15-16. C. Nordenfalk, 'En Medeltida Bonbok fran Metz I Linkopings Stifts- och Landsbibliotek', Linkopings Biblioteks Handlingar, N.W. 4 (1953), 65-88 (p. 88). Margaret Rickert, Painting in Britain: the Middle Ages, 2nd edn (London: Penguin Books, 1965), pp. 139, 142, 148, 156, 162, 166, pl. 123. 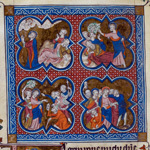 Illuminated Manuscripts Exhibited in the Grenville Library (London, British Museum, 1967), no. 20. Millard Meiss, French Painting in the Time of Jean de Berry: The Late XIV Century and the Patronage of the Duke, 2 vols, National Gallery of Art Kress Foundation Studies in the History of European Art, 2 (London: Thames and Hudson, 1967), pp. 181, 377 n. 8, 380 n. 18. M.W. Evans, Medieval Drawings (London: Hamlyn, 1969), no. 110. Francis Klingender, Animals in Art and Thought to the End of the Middle Ages, ed. by Evelyn Antal and John Harthan (London: Routledge & Kegan Paul, 1971), pp. 413, 418-19, 423, pls 244, 253, 259. O. S. Pickering, 'Some Similiarities between the Queen Mary Psalter and the Northern Passion', Journal of the Warburg and Courtauld Institutes, 35 (1972), 135-44 (pls 17-19). Millard Meiss, with Sharon Off Dunlap Smith and Elizabeth Home Beaton, French Painting in the Time of Jean de Berry: The Limbourgs and Their Contemporaries, 2 vols (London: Thames and Hudson, 1974), pp. 185, 446 n. 41, figs 684, 686. Mary Remnant, 'The Gittern in English Art', The Galpin Society Journal, 17 (1976), 104-09 (pp. 105, 108). Sarah M. Morrall, 'A Schippe Behoues Þe to Dight: Woven Arches of Noah in the Fourteenth Century', Revue de l'Université d'Ottawa, 48 (1978), 202-09 (pp. 204, 205, fig. 1). François Avril, L'enluminure à l'époque gothique 1200-1420 (n. pl. : Bibliotheque de l'image, 1979), p. 94. Janet Backhouse, The Illuminated Manuscript (Oxford: Phaidon, 1979), pl. 37. W. B. Yapp, 'The Birds of English Medieval Manuscripts', Journal of Medieval History, 5 (1979) 315-48 (pp. 335, 335, 346). J. J. G. Alexander, 'Painting and Manuscript Illumination for Royal Patrons in the Later Middle Ages', in English Court Culture in the Later Middle Ages, ed. by V. J. Scattergood and J. W. Sherborne (London: Duckworth, 1983), 141-62 (p. 142). Nigel Morgan, Early Gothic Manuscripts, 2 vols, A Survey of Manuscripts Illuminated in the British Isles, 4 (London Harvey Miller, 1982-1988), II: 1250-1285, p. 111. Lucy Freeman Sandler, Gothic Manuscripts 1285-1385, 2 vols, A Survey of Manuscripts Illuminated in the British Isles, 5 (London: Harvey Miller, 1986), I, no. 56. Lynda Dennison, 'An Illuminator of the Queen Mary Psalter Group: The Ancient 6 Master', Antiquaries Journal, 66 (1986), 287-314. Michael Camille, 'Labouring for the Lord: The Ploughman and the Social Order in the Luttrell Psalter', Art History, 10 (1987), 423-54 (pp. 447-48, il. 17). The Age of Chivalry: Art in Plantagenet England 1200-1400, ed. by Jonathan Alexander and Paul Binski (London: Royal Academy of Arts, 1987), p. 28, figs 6-7 [exhibition catalogue]. François Avril and Patricia Danz Stirnemann, Manuscrits enluminés d’origine insulaire VIIe-XXe siècle (Paris: Bibliothèque nationale, 1987), pp. 142, 143, 145. Christopher Norton, David Park, and Paul Binski, Dominican Painting in East Anglia: The Thornham Parva Retable and the Musée de Cluny Frontal (Woodbridge: Boydell: 1987), p. 79. Michael A. Michael, 'Oxford, Cambridge and London: Towards a Theory for 'Grouping' Gothic Manuscripts', Burlington Magazine, 130 (1988), 107-15 (pp. 107, 19, 112, 113, 114). Linda Brownrigg, 'The Taymouth Hours and the Romance of Beves of Hampton', English Manuscript Studies 1100-1700, 1 (1989), 222-41 (p. 223). Ewa Sniezynska-Stolot, 'Christian Interpretation of the Zodiac in Medieval Psalters', Umeni, 37 (1989), 97-111 (pp. 106 ns 6, 7, 8, 9, 107, ns. 15, 16, 25, 108, ns 35, 53). Michelle P. Brown, A Guide to Western Historical Scripts from Antiquity to 1600 (London: British Library, 1990), pl. 28. Claire Donovan, 'The Mise-en-Page of Early Books of Hours in England', in Medieval Book Production: Assessing the Evidence, ed. by Linda l. Brownrigg, Proceedings of the Second Conference of The Seminar in the History of the Book to 1500, Oxford, July 1988 (Los Altos Hills, California: Anderson-Lovelace, 1990), pp 147-61 (p. 161 n. 36). Dora Faraci, Il bestiario medio inglese (Ms Arundel 292 della British Library) (Rome: Japadre, 1990), p. 258. Ann Payne, Medieval Beasts (London: British Library, 1990), p. 16. A. Rudloff Stanton, 'The Queen Mary Psalter: Narrative and Devotion in Gothic England' (Unpublished PhD thesis, University of Texas, 1992). Janet Backhouse, 'Sir Robert Cotton's Record of a Royal Bookshelf', The British Library Journal, 18 (1992), 44-51 (p. 50, n. 8). Kathryn A. Smith, 'History, Typology and Homily: the Joseph Cycle in the Queen Mary Psalter', Gesta, 32 (1993), 147-59 (figs 1, 5-8). 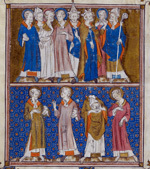 Eberhard König, 'Die Très Belles Heures de Notre-Dame, eine datierte Handschrift aus der Zeit nach 1404', in Flanders in a European Perspective: Manuscript Illumination around 1400 in Flanders and Abroad, ed. by Maurits Smeyers and Bert Cardon (Leuven: Uitgeverij Peeters, 1995), pl. 6, p. 54. Debra Hassig, Medieval Bestiaries: Text, Image, Ideology (Cambridge: Cambridge University Press, 1995), p. 187. Anne Rudloff Stanton, 'Notes on the Codicology of the Queen Mary Psalter' Scriptorium: Revue internationale des études relative aux manuscrits, 48 (1995), 250-62. Kathleen L. Scott, Later Gothic Manuscripts 1390-1490, A Survey of Manuscripts Illuminated in the British Isles, 6, 2 vols (London: Harvey Miller, 1996), II, pp. 63-64. Anne Rudloff Stanton, 'La Genealogye Comence: Kinship and Difference in the Queen Mary Psalter', Studies in Iconography, 17 (1996), 177-214. 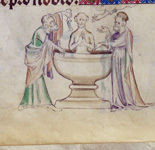 Anne Rudloff Stanton, 'From Eve to Bathsheba and Beyond: Motherhood in the Queen Mary Psalter', in Women and the Book: Assessing the Visual Evidence, ed. by J. H. M. Taylor and L. Smith (London: British Library, 1996), pp.172-89 (figs 73-82). Janet Backhouse, The Illuminated Page: Ten Centuries of Manuscript Painting in the British Library (Toronto: University of Toronto Press, 1997), no. 88. 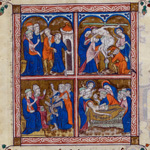 Lilian M. C. Randall, Medieval and Renaissance Manuscripts in the Walters Art Gallery, 3 vols (Baltimore: The Johns Hopkins University Press, 1989-1997), III: Belgium, 1250-1530, 2 vols, I, nos. 231-32. Ruth Dean and Maureen Bolton, Anglo-Norman Literature, A Guide to Texts and Manuscripts (London: Anglo-Norman Text Society, 1999), no. 465. John Higgitt, The Murthly Hours: Devotion, Literacy and Luxury in Paris, England and the Gaelic West (London: British Library, 2000), pp. 81, 229, 241-42, 245, 248-49, 273 n. 66. John Lowden, The Making of the Bibles Moralisées, 2 vols (University Park: Pennsylvania State University Press, 2000), II: The Book of Ruth, II, 261 n. 3, 292 n. 3. Pamela Porter, Medieval Warfare in Manuscripts (London: British Library, 2000), p. 34. Christopher de Hamel, The British Library Guide to Manuscript Illumination: History and Techniques (London: British Library, 2001), pl. 18. Martine Meuwese, 'Die Illumination der Detmolder: Der Naturen Bloeme handschrift', in Jacob van Maerlants 'Der natren bloeme' und das Umfeld: Vorläufer, Redaktion, Rezeption, ed. by A Berteloot and D. Hellfaier (Berlin: Waxmann Münster, 2001), pp. 135-52 (p. 143, il. 21). Anne Rudloff Stanton, 'The Queen Mary Psalter: A Study of Affect and Audience', Transactions of the American Philosophical Society, New Series, 91 (2001), 1-287. Alixe Bovey, Monsters and Grotesques in Medieval Manuscripts (London: British Library, 2002), p. 40, pl. 34. Herman Braet, 'L'instruction, le titulus, la rubrique: Observations sur la nature des éléments péritextuels', in ’Als Ich Can’: Liber Amicorum in Memory of Professor Dr. Maurits Smeyers, ed. by Bert Cardon and others (Paris: Uitgeverij Peeters, 2002), pp. 203-12 (p. 206). Sophie Page, Astrology in Medieval Manuscripts (London: British Library, 2002), pp. 47-49, pl. 39. C. M. Kauffmann, Biblical Imagery in Medieval England 700-1500 (London: Harvey Miller, 2003), pp. 205, 214-15, 218, 225, 227, 232, pls. 165-67. Anne Rudloff Stanton, ‘Isabelle of France and her Manuscripts’, in Capetian Women, ed. by Kathleen Nolan (New York: Palgrave, 2003), pp. 225-52 (pp. 229, 234-37). Alixe Bovey, The Chaworth Roll: A fourteenth-century Genealogy of the Kings of England (London: Sam Fogg, 2004), pp. 10, 13, figs 2, 4. Sophie Page, Magic in Medieval Manuscripts (London: British Library, 2004), pp. 8-9, 21, pl. 4, 21. Lucy Freeman Sandler, The Lichtenthal Psalter and the Manuscript Patronage of the Bohun Family (London: Harvey Miller, 2004), p. 80, 157 n. 61. The Cambridge Illuminations: Ten Centuries of Book Production in the Medieval West, ed. by Paul Binski and Stella Panayotova (London: Harvey Miller, 2005), pp. 191, 195. Jean A. Givens, Observation and Image-Making in Gothic Art (Cambridge: Cambridge University Press, 2005), p. 164. The Splendor of the Word: Medieval and Renaissance Illuminated Manuscripts at the New York Public Library, ed. by Jonathan J. G. Alexander, James H. Marrow, and Lucy Freeman Sandler (London: Harvey Miller, 2005), p. 213 n. 1 [exhibition catalogue]. Treasures of the British Library, ed. by Nicolas Barker and others (London: British Library, 2005), p. 24. François Boespflug, ‘Le singe de Dieu: À propos du diable dans l’art d’Occident (XIIe-XXe siècle)’, in Festschrift zu Ehren Eberhard Königs 60. Geburtstag, ed. by Mara Hofmann and Caroline Zöhl (Turnhout: Brepols, 2007), 45-52 (p. 51 n. 47). 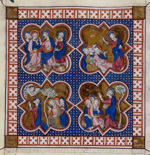 Michelle P. Brown, The Holkham Bible: A Facsimile (London, British Library, 2007), pp. 9, 15. Deirdre Jackson, Marvellous to Behold: Miracles in Medieval Manuscripts (London: British Library, 2007), p. 83 pl. 70. Scot McKendrick and Kathleen Doyle, Bible Manuscripts: 1400 Years of Scribes and Scripture (London: British Library, 2007), p. 128, fig. 115. M. A. Michael, 'Seeing in: The Macclesfield Psalter', in The Cambridge Illuminations: The Conference Papers, ed. by Stella Panayotova (London: Harvey Miller, 2007), pp. 115-28 (p. 120). St Augustine's Abbey, Canterbury, ed. by B. C. Barker-Benfield, Corpus of British Medieval Library Catalogues, 13, 3 vols (London: British Library, 2008), p. 1741. Joe Flatman, Ships and Shipping in Medieval Manuscripts (London: British Library, 2009), pls 1, 70, 142-45. Richard W. Pfaff, The Liturgy in Medieval England: A History (Cambridge: University Press, 2009), p. 220 n. 71. 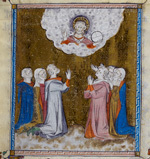 Royal Manuscripts: The Genius of Illumination (London: British Library, 2011), no. 85 [exhibition catalogue]. Aden Kumler, Translating Truth: Ambitious Images and Religious Knowledge in Late Medieval France and England (New Haven: Yale University Press, 2011), pp. 125 (fig. 39), 126. Nicholas Vincent, 'The Great Lost Library of England's Medieval Kings' in1000 Years of Royal Books and Manuscripts, ed. by Kathleen Doyle and Scot McKendrick (London: The British Library, 2013), pp. 73-112 (pp. 73,74, 90, 91). Jane Roberts, 'The Royal Library at Windsor Castle' in 1000 Years of Royal Books and Manuscripts, ed. by Kathleen Doyle and Scot McKendrick (London: The British Library, 2013), pp.237-65 (p. 254). Jeffrey F. Hamburger and Nigel F. Palmer, The Prayer Book of Ursula Begerin, 2 vols (Dietikon-Zurich: Urs Graf Verlag, 2015), I, pp. 56, 157. Christian Heck, 'L'Idolatrie de Salomon dans l'art de la fin du Moyan Age: du theme bibilique a la scene de genre', Builletyn Historii Sztuki, 79 (2017), 413-28 (pp. 416-18). Kathryn A. Smith, 'St. Edward's Chair in the Queen Mary Psalter', Electronic British Library Journal (2017), art. 10, 1-18 (http://www.bl.uk/eblj/2017articles/article10.html). 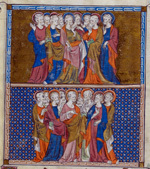 Blank folio f.233, miniature on verso.